For example, the moment in the photo above was me savoring the luxurious feel of my brand new coat! I never even had a coat before so not only is this coat new but the whole coat concept is new. And I am loving it. The coat was made by one of my very favorite fans (although it is amazingly hard to even talk about favorite fans since I have so very many wonderful people stalking me.) (Oops, I meant, friending me or whatever.) The coat was made by Mansie O’Leary. You may remember her from such wonderful gifts as my alien antennae and tie. That is actually my most viewed video. Mansie was thinking that when the cold weather comes, I need a little something to augment my fur–which is not very warm or dense–so she made me this beautiful coat that my owner just had to photograph. There was no getting out of it so eventually I went back to grazing and let her take her photo. Don’t I look great in that coat? Okay, it might make me look just a little bit fat because I can’t fasten the strap around my belly. I think a tiny alteration will fix that. The only other problem is that it doesn’t have a hole for my leash to come out from under it so I can’t wear it with my harness when I go out in public. I am going to see if Mansie can fix that for me. 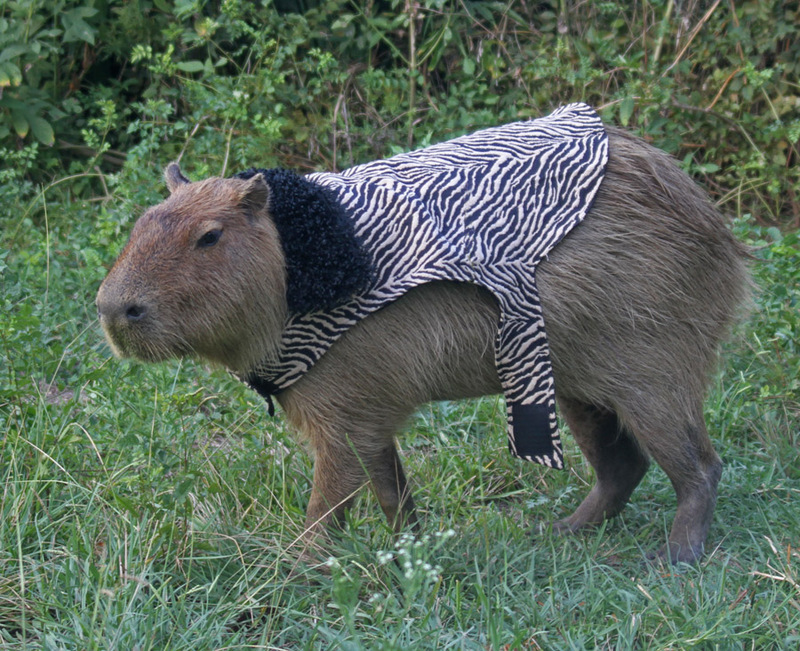 Once those two little problems are solved–and the weather cools down about 50 degrees–I will be the best-dressed, most high-stepping, super-chic capybara in the world! I would greatly appreciate it if everyone would leave a comment on this post to let Mansie know just how wonderful they think my new coat is. We had the same problem with our pug. Just cut a little slit where you harness comes out and you’ll be stylin in no time! I think the tailoring is fantastic and the pattern choice inspired. Well done, Mansie! That is a great coat and so glad you will be warm when it gets chilly! Had not even thought about that sure glad Mansie did. It’s spectacular, and it’s really hard to fit a person (and you are a person, Caplin) long distance, so I think it will soon be tailored to fit you perfectly. Caplin, you look so glamorous in your zebra coat! Like you’re about to go shopping downtown. You know, like Petula Clark…. Just listen to the music from the bars along South Congress! Amble down the sidewalk showing off your winter coat-vest! Ooo Caplin you duz look so hansome an kinda like a zeebra! I luvs that coat on your gorjus self. Caplin, it is INDEED a beautiful coat. And you look fabulous wearing it!! That coat was made with lots of love for everyone’s favorite Caplin!!! You really look adorable! 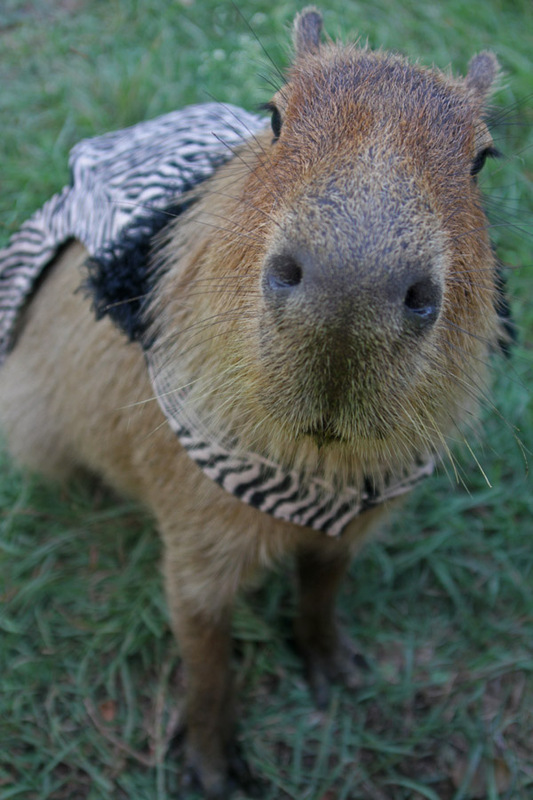 I Want a Capybara,too!! Your owners SO LUCKY to have you!! Your coat is my favorite prints (by the way)!! You look ADORABLE!!!!!!!!!!!!!!!!!! 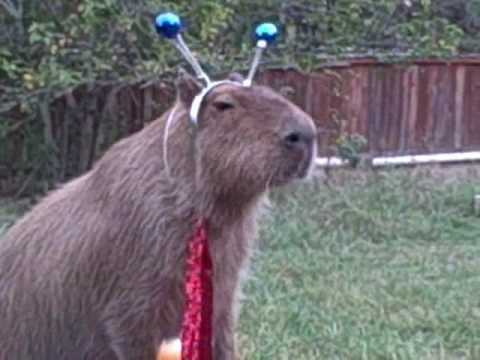 I Want a Capybara,too!! Your owner is SO LUCKY to have you!! Your coat is my favorite prints (by the way)!! You look ADORABLE!!!!!!!!!!!!!!!!! !